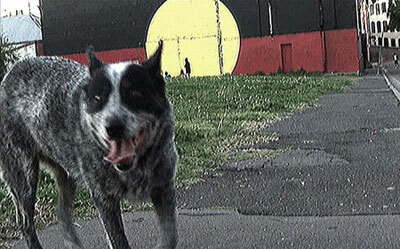 Wanja: Warrior Dog is a documentary about an area in Redfern, Sydney, called 'The Block' viewed through the eyes of Auntie Barb and the life of Wanja her blue heeler dog, recently deceased. The community on The Block's many and varied stories of Wanja reflect on the issues affecting this Indigenous community in the heart of Sydney. Auntie Barb is an elder of Redfern's community, who lived on The Block for twenty years with her family and dog, Wanja. Wanja was an integral part of the community, known to all for her ability to sniff out the police - in uniform and undercover -'the Block's guardian angel'. Through Wanja 'Warrior Dog', Aunty Barb and the community's memories of this tenacious, loyal, smart and loving dog tell of the early days on the Block when there were elders and families, good housing and a strong sense of community. The stories of Wanja tell us how the tension between the community and police escalated, why the housing has continued to deteriorate and largely been demolished, and why the strength of the community - its elders, moved on. Aunty Barb was one of the last elders forced off The Block. In spite of this, Aunty Barb continues to call The Block her community and home. Still from 'Wanja: Warrior Dog' by Angie Abdilla. In the background the famous Aboriginal flag painted on a brick wall.